From Daily Herald, July 26, 2017: The ICARUS neutrino detector — the largest liquid-argon particle detector ever built ­— ended its intercontinental journey Wednesday, rolling through the gates of its new home at Fermi National Accelerator Laboratory in Batavia. From The Beacon-News, July 26, 2017: Fermilab scientist Catherine James reflects on the large box sitting on a flatbed that contained half of the ICARUS liquid-argon particle detector, at 60 feet long and 120 tons the largest of its kind, which she will work with when its installed and running by the end of the year. From LiveScience, July 21, 2017: On the occasion of the LBNF/DUNE groundbreaking, Fermilab scientist Don Lincoln explains why neutrinos are so compelling. From Popular Mechanics, July 21, 2017: The DUNE experiment will study neutrinos and antineutrinos and possibly unravel the secrets of the universe. From CNN, July 22, 2017: Fermilab scientist Don Lincoln explains how the Deep Underground Neutrino Experiment, which had its groundbreaking ceremony on July 21, could answer important questions of the universe, including, “Where did the antimatter go?”. 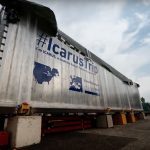 After a six-week journey from CERN in Geneva, Switzerland, the ICARUS detector is expected to arrive at Fermilab late afternoon today, July 26. From Science, July 21, 2017: To build the modular detector, workers have to carve out massive caverns 1,480 meters underground, haul out stone that weighs as much as a dozen aircraft carries, and truck in millions of liters of frigid liquid argon. On July 21, officials gathered deep underground to turn the first few shovels of stone. From Idaho State University, July 19, 2017: Tatar plans to participate in the Long-Baseline Neutrino Facility groundbreaking ceremony in South Dakota, joining a group of world known scientists. From Colorado State University, July 14, 2017: CSU is just one of the DUNE collaborating institutions that is looking forward to the July 21 groundbreaking for the Long-Baseline Neutrino Facility.